Thank you for your interest in our tapestries. Please leave us your name and email and we will get back to you right away with information about the purchasing and shipping process. Click here to read what our clients are saying about us. 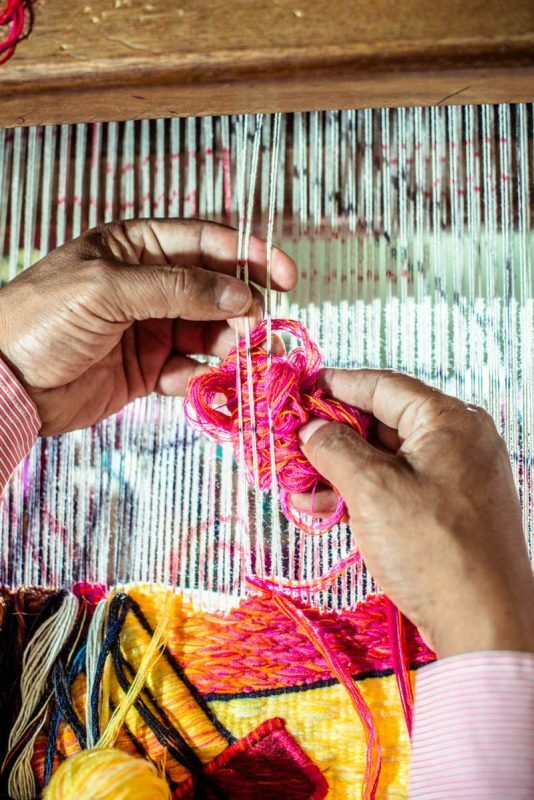 All tapestries ordered directly to Maximo Laura’s Studio in Lima, Peru, are woven by request and the weaving time depends on the size and complexity of each piece. For the tapestry “Dance of the Fire Gods” the weaving time is of 8 weeks. – Once the form in sent we will get in touch with you through an email in order to proceed with the following steps and confirm your order. – The payment for all tapestry orders can be coordinated at the moment the order is placed or once the tapestry is completed and ready to ship. 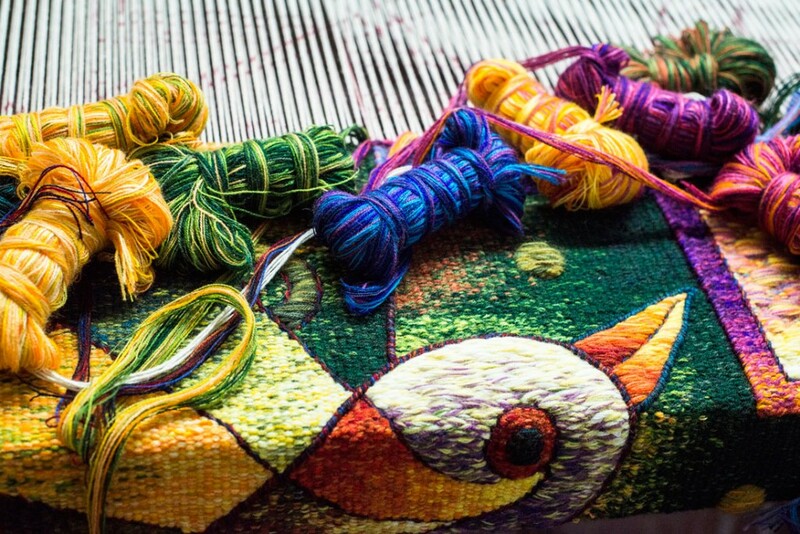 – When your tapestry is half-way completed we will send you a group of photos that show the progress of your tapestry. 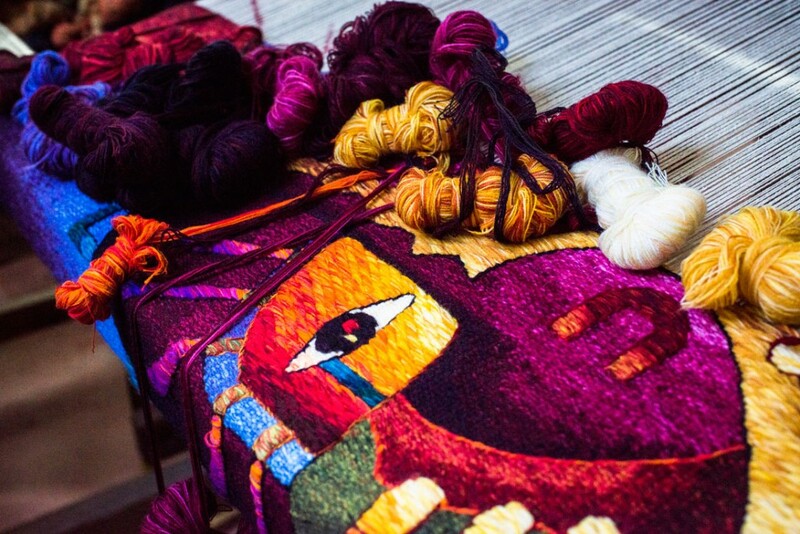 – Upon completion of the tapestry we will send you a final photograph of your tapestry to ensure customer satisfaction and proceed with the payment process. – The payment can be coordinate using Paypal or a bank-to-bank wire transfer. – We will coordinate the shipping of your tapestry to the address provided using DHL International Shipping and send you a confirmation email containing the tracking number for your package. 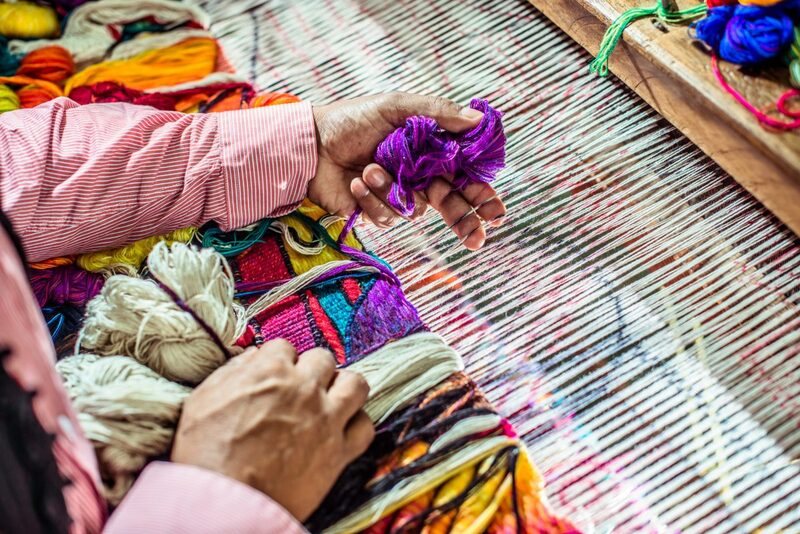 It is important to note that all tapestries are hand-woven and all colors used for the weaving of the tapestry are combined by hand. Due to this special process, although the design and colors used to prepare the tapestry are the same, there can be slight changes that make each tapestry especially unique. Should there be any questions please don’t hesitate to get in touch with us through the “Send an Enquiry” button at the top of this page. There are so many layers of experiencing Maximo's tapestries. 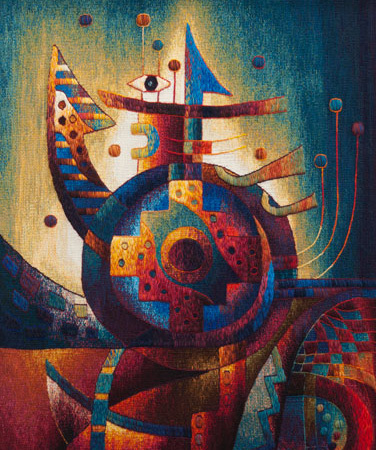 At a distance, they are bold and imaginative and always manage to stir a sense of connection to something that is both grounding and cosmic. 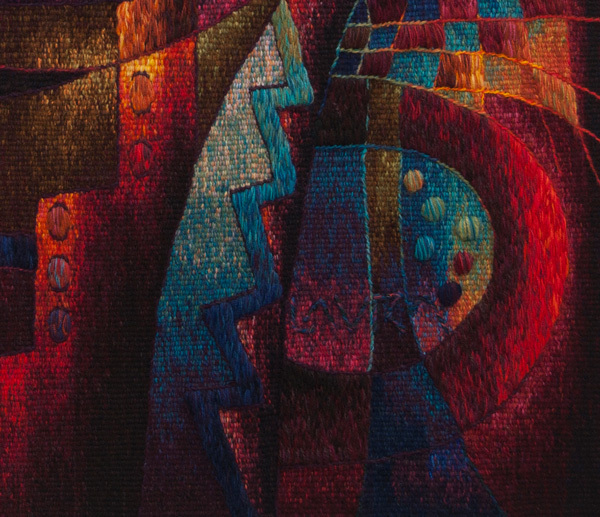 Overtime, these tapestries have delighted me with endless discoveries of details in their form, texture, and color that are sometimes humorous, sometimes perspective-changing, and always thought provoking. Working with Maximo Laura's studio in making the purchase of our first tapestry was just a fantastic experience. We had the opportunity to visit Maximo's studio in Lima where we were treated with the utmost hospitality and left feeling connected not just as fans and customers, but as kindred friends. I cannot recommend working with and being inspired by Senor Laura's art enough. After seeing this beautiful tapestry by Maximo Laura I was convinced I was not leaving Peru without making the purchase. Giancarlo Soldi, the Maximo Laura Studio Representative, filled us in on the story behind this unique tapestry along with many, many details behind Mr. Laura's inspiration for the piece. Its overwhelming beauty was enough to make the commitment but the added story, iconography, and the conveyed personal inspiration of the artist is one I will be able to share with friends and family. We are very proud and happy to share this breathtaking tapestry with guests to our home in California. Thank you, Mr Laura, and Giancarlo for sharing your amazing art with us! The two tapestries that we purchased online from Maximo Laura were exactly as we had viewed them on the website. They of course are stunning and we receive many comments saying how unique and beautiful they are. Initially, I was worried about ordering something from Peru because of possible shipping and monetary exchange issues. Giancarlo Soldi, the person I dealt with could not have been more helpful and true to his word. Ordering and turned out to be seamless, the transaction was made easily via credit card and the delivery was as promised. It was not feasible for me to purchase a tapestry when I visited the Museum in Cusco. But when I discovered I could purchase one via their website I was thrilled. There were many different styles to choose from and when I finally settled on one that I loved, I communicated, via email with them. My experience from start to finish was flawless: they responded when they said they would, didn't ask for payment until the tapestry was complete, and delivered exactly what I expected when they promised it would be there. Everyone has been very nice and accommodating. We love our tapestries. They are an important part of our home, that add color and thoughtfulness. Thanks. Beautiful tapestry, shipped as promised to Canada, and has hung in my house for years! Dealing with your organization was an absolute pleasure in every way possible. From order to queries to delivery and the tapestry is magnificent. Everyone who visits my home just sits and marvels at my tapestry with its intense colours varying weaving techniques. I love it. When visiting Peru my friend bought a tapestry from the gallery and had it shipped with no problems and once he had it mounted in his new house I knew I had to have one for myself. I found Dance of the Fire Gods was the perfect size and colours for my home. At dawn as the sun rises the flames in the tapestry come alive - it's my favourite time of day. The buying process was smooth with no unwelcome surprises. The tapestry is exceptional beautiful. I was and still am very thrilled to have the work of Maximo Laura in my home. It's been a couple years since getting the tapestries and they continue to give me great joy. It was as easy to shop and purchase as it is to buy on Amazon. The dealer kept me abreast of progress and total pricing. Each time I purchased tapestries, I was not disappointed. Color may even be more vibrant than in catalog which was such a delightful relief. Can't wait for my next art piece to display in my home. I consistently get glowing and admirable comments on them. Exceptionally beautiful and meaningful artwork. We saw our first Maximo Laura piece at a gallery in Mexico while on vacation. My husband and I later checked your website and were thrilled to find we could order the piece we liked the most. We liked the piece we saw in Mexico but love the piece we actually ordered. It looks stunning hanging on the wall in our TV room. We were totally pleased with the process your offered...... service ordering, updates and shipping time. I have 3 tapestries. Working with the folks at Laura has been easy. Highly recommend if you want a tapestry. 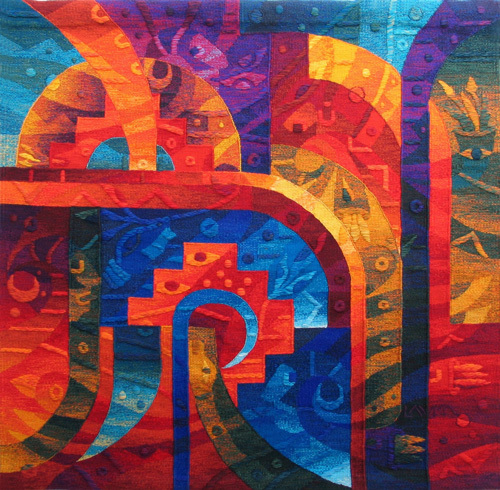 The first time I saw a Laura tapestry in Cusco, I was astounded at the beauty of the design and colors. I had a difficult time choosing which to purchase, I knew I had to have one! The second time I came across them was in the Galapagos ...so I got another. Then when I discovered the website, I could not resist buying a third. The staff was very helpful and they allowed me to alter some of the color. The artwork was exactly what I wanted. I am I love with the work of Maximo Laura! The tapestry is absolutely beautiful. Everyone who sees it, loves it. I had no problem at all with the purchase or the shipping. We hope to buy another one in the future. 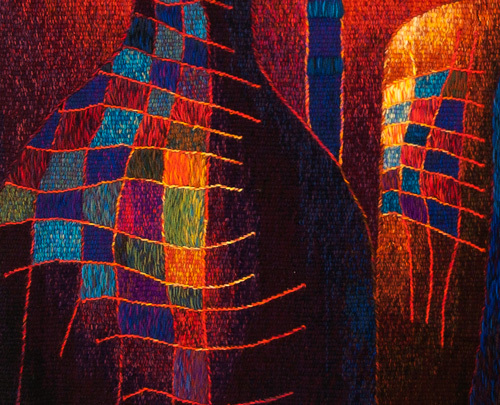 I had not seen such beautiful use of colour, shape and craftsmanship before I came across Maximo Laura's tapestry work. I smile every time I glance across my room and see it. I still can't believe it's mine. I am very pleased with my experience purchasing a tapestry from the Maximo Laura website. The service was courteous and prompt and the tapestry arrived on time, along with a beautiful coffee table book about Maximo Laura and his work. The tapestry is a wonderful memento of our trip to Peru and a beautiful addition to our art collection. I am from Canada and saw Maximo's work in a gallery on a trip to the Galapagos. I was a bit nervous about ordering a tapestry online but they get me up to date on the status of the work. When it was finished they sent me a picture of the finished product and let me know when it would be shipped. It was completed and arrived in the time frames they indicated. I purchased Towards Home and most importantly it is as beautiful as I hoped it would be. I had a great experience with the website. I have purchased two works. The pictures from the website are very accurate but the difference of having one in your home where you can stand and look at it is really something. If you are thinking of buying one you need have no concerns. These are professional people who are dedicated to the finest art and have outstanding customer service. You will not be disappointed. The experience of purchase with Maximo Laura is unique in that your order is made to request. My order status was regularly updated and any questions I had were promptly answered. My family absolutely love my tapestry and the designs are great talking points. The hardest thing about the process is choosing which design to purchase! I have now purchased two tapestries. The process was simple and without problems. The tapestries have added a warmth and distinction to our home that will be timeless. Our first tapestry has been in our home for more than 2 years, and there is still hardly a day goes by that I do not sit at the end of a long day and simply enjoy the serenity and beauty of the tapestries hanging on the wall. Every day they remind me of how fortunate my family and I are to be able to have such treasures in our home. These are true heirlooms that will be in the family for generations to come. I have nothing but positive things to say about this artist. Maximo Laura's work is breathtaking and timeless. I was extremely impressed with the care and assistance I was provided by his staff while ordering his work and will definitely purchase again. 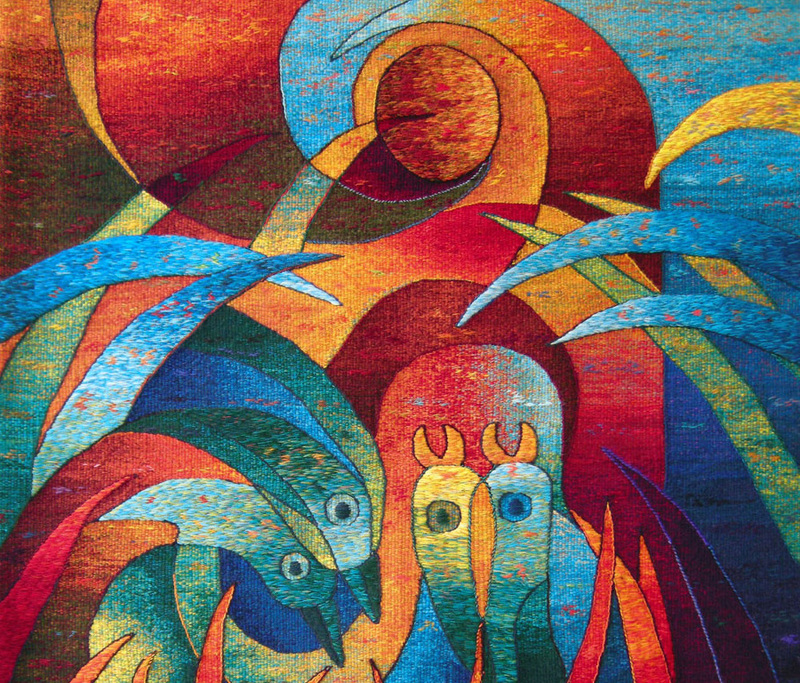 The designs, colors and relief in Maximo Laura's tapestries have taken the art form to new heights. They will be enjoyed for centuries to come. The tapestry is more beautiful that it seemed to be on the photo. I received quick answers each time I had a question. A nice service and incredible art. When we purchased a Laura tapestry, we brought home the most authentic Peruvian gift we could give our family and our home here in Alaska. It delights us everyday. We now have two Maximo Laura tapestries hanging in our home, and the artwork has changed the look and feel of our home in a very positive way. Guests in our home continually comment on the works. A treasured piece of art that will only go up in value. Our tapestry is the first thing people comment on when they enter our house. It really is spectacular in color and composition. I admire the creativity of Maximo Laura and quality of his works. The piece that I bought decorates one of the most frequently used locations in my house. Everybody loves it. 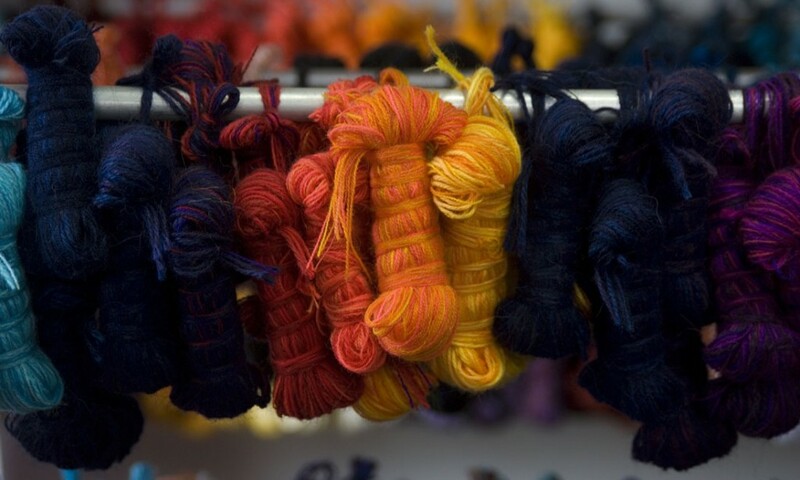 When visitors come to the studio a common question asked is: how are the tapestries made? For example, the tapestry below this paragraph is what Mr. Laura calls a Mural Tapestry and it has a size of 5 x 7 feet (176 x 400 cm). The weaving time for a piece of this size is of 6 - 8 months. During a visit we are able to share the whole process in person so through this page we would like to share with you the steps to creating a Maximo Laura Tapestry. All tapestries by Maximo Laura start as a small drawing on a sheet of paper. 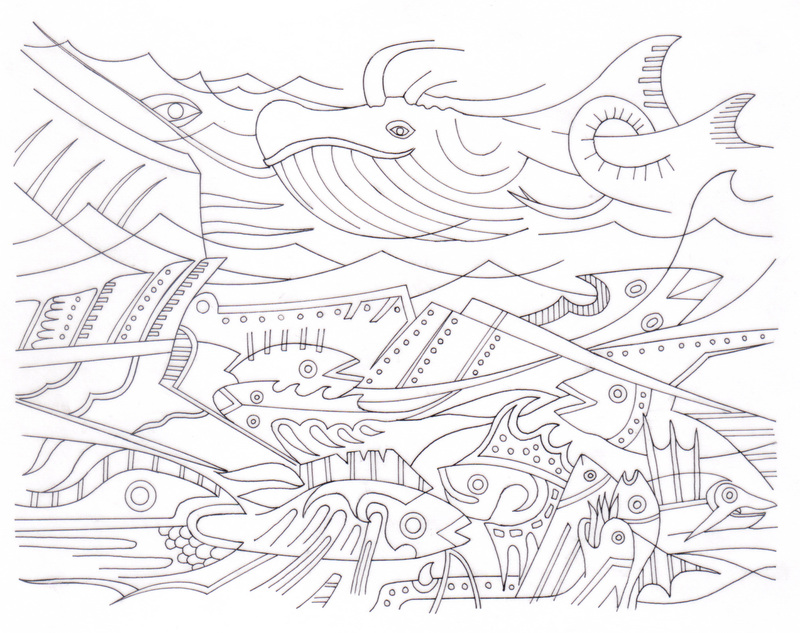 Mr. Laura works and organizes his designs by series or themes, so depending on the theme that he is currently working on, he might develop a drawing about Andean Musicians, about Sea Life or about Andean Mythology. 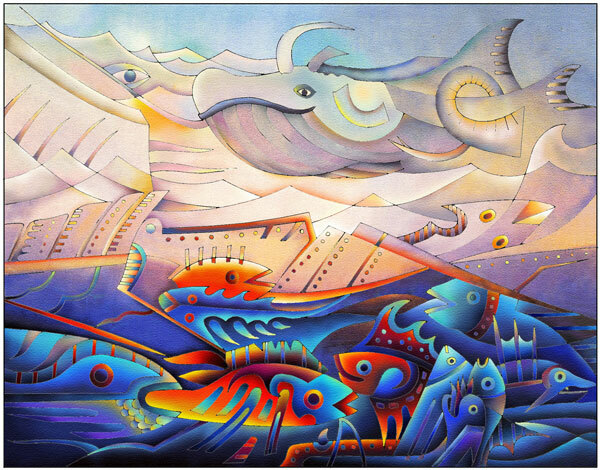 There are a number of themes that he likes to explore, among them we can find: Musicians, Sea Life, Mountains, Birds, the Jungle, Landscapes, Animals, Andean Mythology and Symbols. The creation process for a tapestry can take from 3 takes to many months, depending on the size and complexity of each piece, so while working on the drawings, Mr. Laura also has to have in mind the technical complexities that will have to be worked in the tapestry while making the drawing, as a more complex drawing might need more techniques and might take more time to create. Once the design has been drawn, Mr. Laura continues with the coloring of the design, which is done by Mr. Laura with color pencils or with a computer as we can see below. 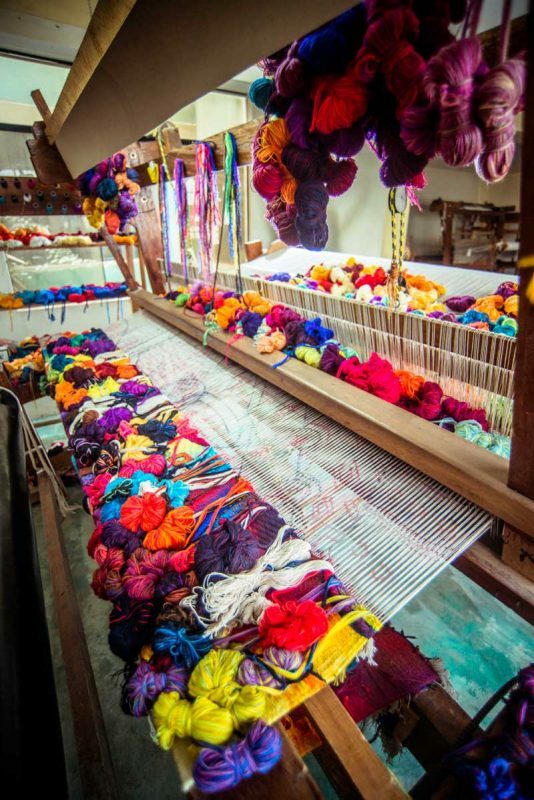 Once the line drawing and colored image are ready, the design will go to the Color Laboratory where a specialist will hand-blend the colors to create what Mr. Laura calls “butterflies” of yarn, which will be the yarn used to weave the tapestry. Each “butterfly” is created by hand-mixing single or multiple solid color threads to match the required tones of a tapestry, creating the bright and vibrant color combinations and tones for which Maximo Laura is known for. This special process is also the reason why if one sees an specific point in a Maximo Laura Tapestry, one will always find a variety of colors in a very small space, making it very hard to find solid colors within the piece. At the bottom of this page we will have a gallery of images with details in very high resolution so you can click and zoom the detail to see each point and the mix of colors within that specific detail. The small line drawing is then drawn or printed to the scale of the tapestry, creating what is known as the “cartoon”. The cartoon will be transferred to the cotton warp threads on the loom to guide the weaver. 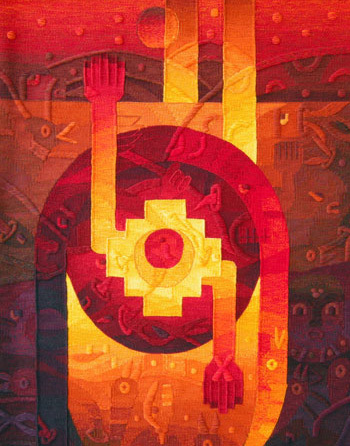 The cartoon also specifies the sections of the tapestry where different textures and techniques will be included so it serves as a guide for the weaver. 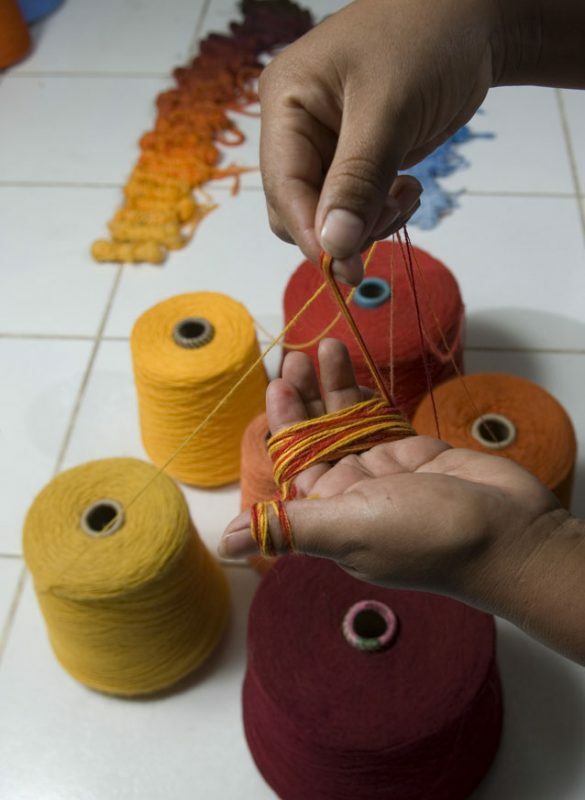 All Maximo Laura Tapestries are handwoven on a floor loom by a selected group of Master Weavers who have been trained by Mr. Laura on his own techniques. In Peru, tapestry weaving is an art that is transferred from generation to generation through family, so most of the Master Weavers who work with Mr. Laura have a background in traditional tapestry and have been trained by Maestro Laura to learn his techniques and process. Row by row, the colors and textures emerge into images under the careful supervision of Maximo Laura. 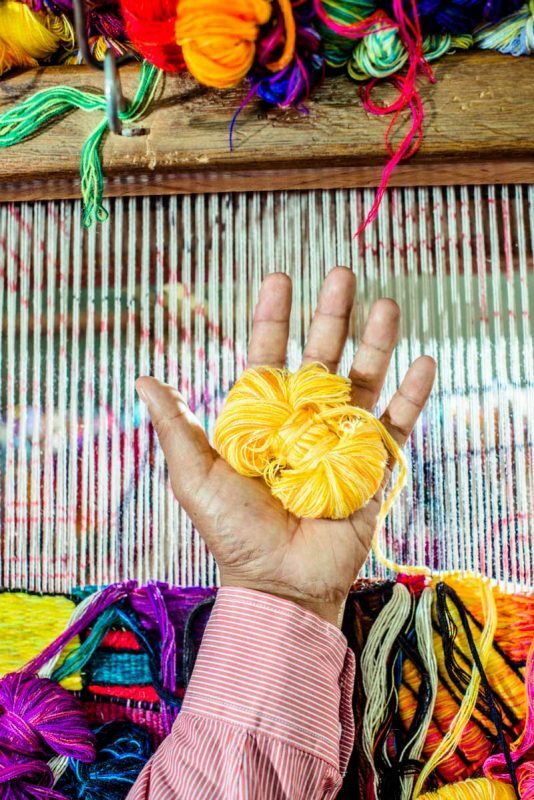 Some tapestries might take weeks to create, others might take months, but they all take the patience and attention to detail of experts to become a piece. 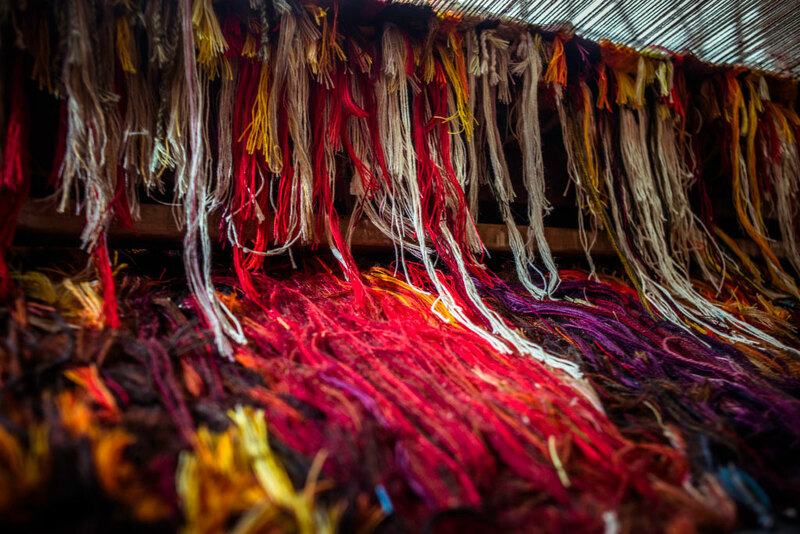 After the weaving process is completed, the tapestry is taken out of the loom and goes through a cleaning and stretching process. You can see in the photograph below how the back of the tapestry has very long threads hanging during the weaving process, so those threads are lowered and the tapestry is cleaned. 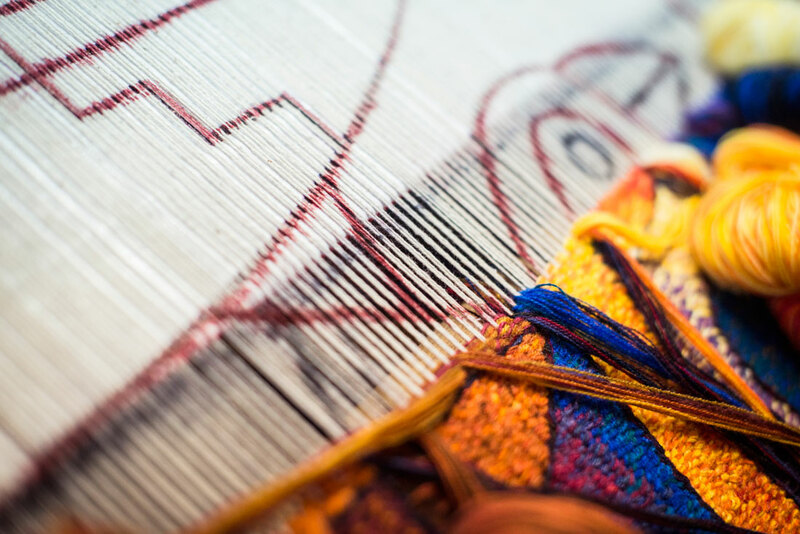 The stretching process helps with the elasticity of the tapestry, as there is a change of tension when the tapestry is taken out of the loom, by stretching the piece the final size will be defined. Once the tapestry has been cleaned and stretched, a Certificate of Authenticity will be stitched onto the back of the tapestry, signed by Laura and the piece will be ready be sent to its owner or gallery. 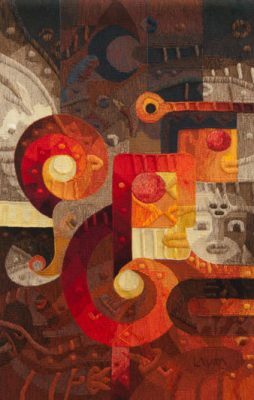 There is always a curiosity to know more about the meaning behind the tapestries by Maximo Laura so in this page we would love to give you a guideline on how to read his works. 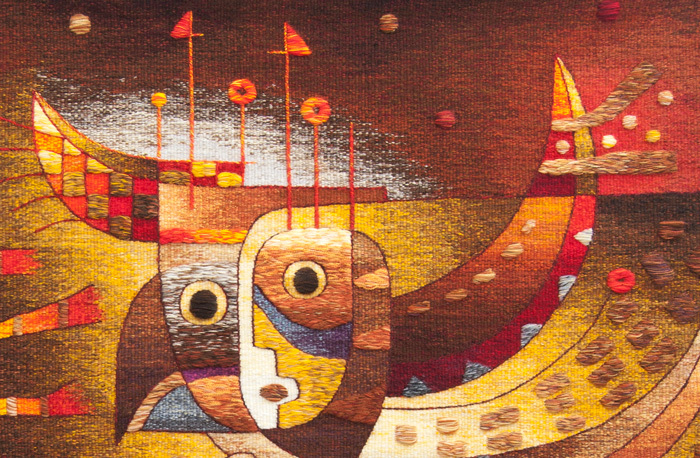 During his 34 years as a Textile Artist, Maestro Laura has created many series and collections of works, exploring a number of themes and tapestry techniques during different states in his life, but a constant through his career has been his ideal to create a continuity of Peru’s millenary textile history, to give his culture and traditions a voice in the 21st Century, and to do this he combined a contemporary aesthetic with traditional techniques, designs, myths and symbols. 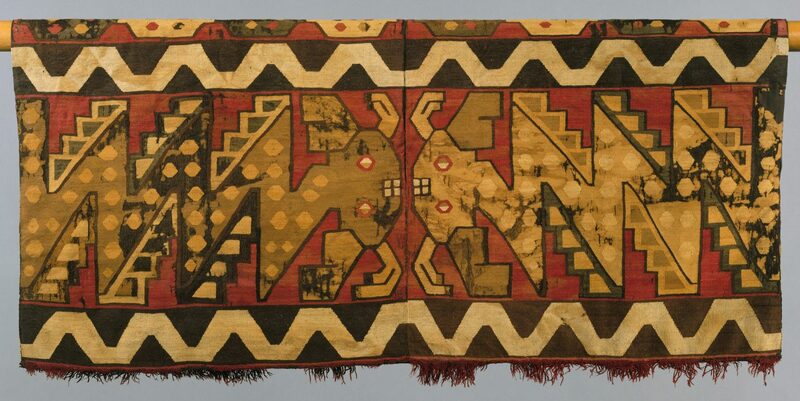 Because of this, it is important to understand a couple Andean concepts to be able to read his tapestries. First of all, when you see the works of Maximo Laura it is common to see in a number of them the figures of the Sun or the Moon at the top of the piece. This is because in the Andean cosmology, the Inti or Sun God was one of the most important deities, the provider of warmth and light, a protector of the people. According to the legends, Inti taught his son and daughter the arts of civilization and they were sent to earth to pass this knowledge. The Sun still carries a very important role in the Andes today and there are many festivals and ceremonies celebrated around its importance, such as the Inti Raymi in the city of Cusco. In other tapestries you will a figure of the Moon instead of the Sun, which in Andean cosmology is Mama Killa, the Mother Moon and the sister of the Sun God. Traditionally, the Sun God is portrayed as a golden disk, while the Moon goddess is portrayed as a silver disk. When exploring the tapestries you might also find a number of works where the Sun and Moon are showed together. This makes reference to the idea of Complementary Dualism found in Andean cosmology, understood as two opposite beings which are in need each other to create balance and stability. In this case, the dualistic relationship is between a Sun (male deity, the Sun God) and the Moon (female deity, the Mother Moon). In this specific case, the dualistic view is also found in the cyclic way of viewing the world, such as the “fight” and complement of day and night, the sun and the moon, male and female. In other tapestries you can see this concept represented by two faces displayed in opposite directions, but that might share a common characteristic such as an eye or the mouth. 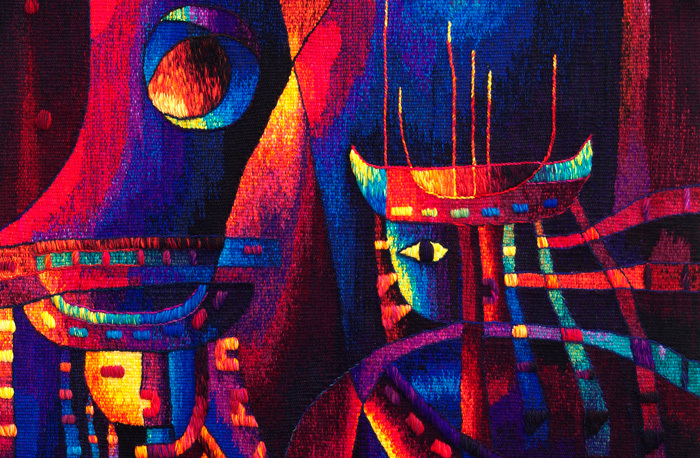 This dualistic view of the world is found in many expressions of Andean cultures, from political and social organization, to religious ideas, rituals and creation myths. 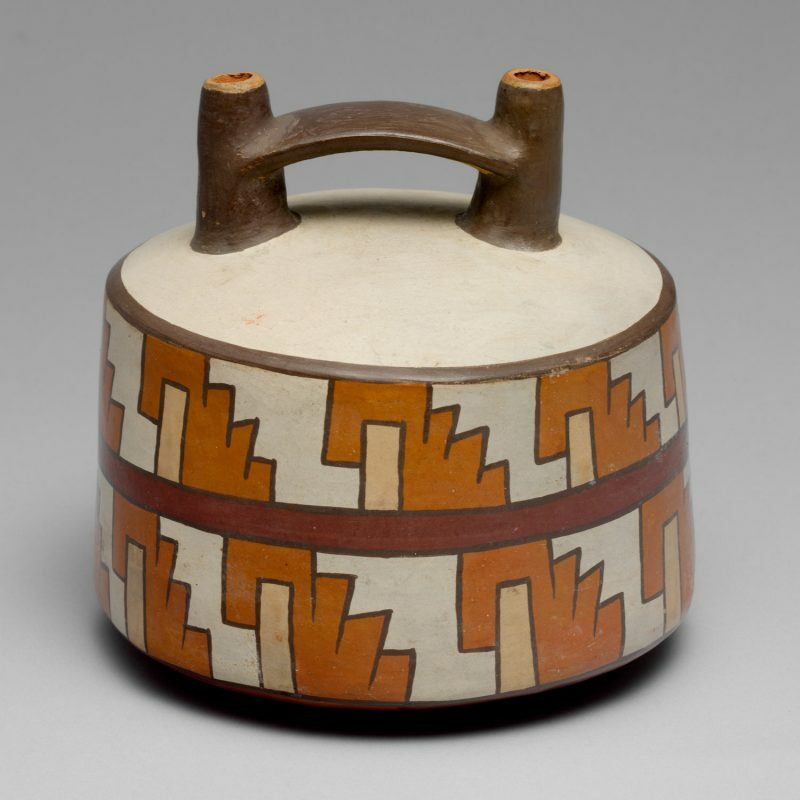 Dualism has many roots in pre-Columbian art, as we find zoomorphic creatures paired with inverted symmetries in the Andes as early as the Preceramic period. We can also find pairs and visual oppositions in most Andean cultures through time in silverwork, ceramic and architecture, but it is in woven textiles where we find this expression at its peak through anthropomorphized felines, birds, geometric patterns and designs. 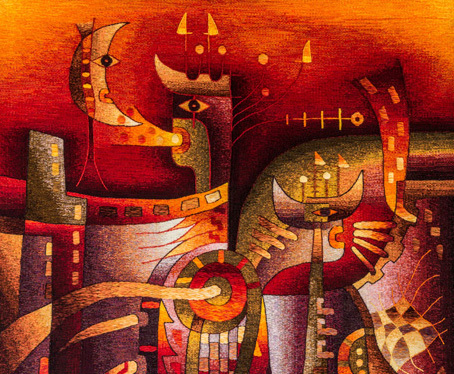 Another important concept that we need to understand when reading the works of Maestro Laura is that in Andean cosmology, the cosmos is divided in three realms or three pachas: Hanan Pacha, Kay Pacha and Uku Pacha. The three pachas represent different levels or existence that are interconnected by spiritual and mythical elements. They shaped the religion of the Incas and the life of the people. The Hanan Pacha is the world of the above, of celestial beings, the world of the gods, of the Sun God and the Mother Moon. The Incas believed that one would ascent to the Hanan Pacha after death. This realm is normally represented by the figure of the condor, the Sun or the Moon and in Maestro Laura’s tapestries it can also be represented by the stars or flying being. The sacred mountains or “Apus” are thought to have spirits that bridge the gap between man and the Hanan Pacha, which is why in the Andes many mountains and their peaks are viewed as sacred, and many times used as a location for ceremonies. This is also why Maestro Laura includes the mountains as an important theme for many of his works, sometimes found in the background of a tapestry or as the main theme of a piece. The Kay Pacha is the middle world (literally meaning “this world”). This is the realm of the living, of the present, of humans, the earthly world. This realm is normally represented in Maestro Laura’s tapestries by a jaguar or by human figures. The Uku Pacha is the inner world, the world of the dead as well as of the new life, the world of fertility, of earth and that which is beneath the earth (traditionally represented by the figure of a snake). 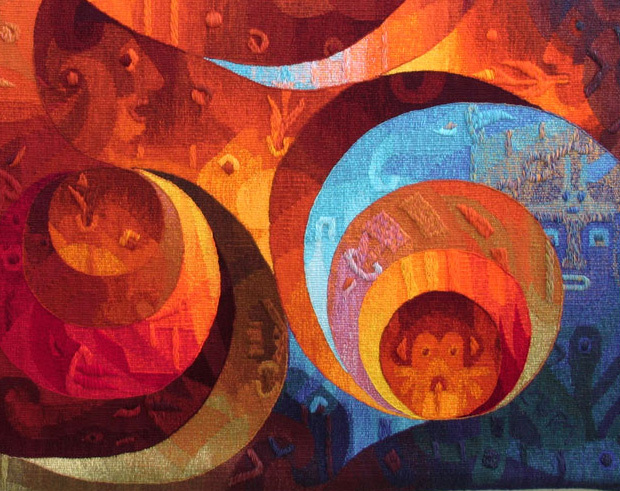 Now that you understand these three realms and their representations, you can see that many tapestries by Maestro Laura express these same realms in a visual way. In many works we can find the Sun, or the Moon, the stars or the Condor at the top of the design, representing the Hanan Pacha. In the middle we might be able to find human figures such as faces, or felines, representing the Kay Pacha. At the bottom of many pieces we can find the figure of snakes or roots, representing the Uku Pacha. With this information we can also understand the type of “arrow” figures that we find in many tapestries, going towards the top of the design, going from the earthly world (Kay Pacha) towards the upper world (Hanan Pacha) and creating a connection. 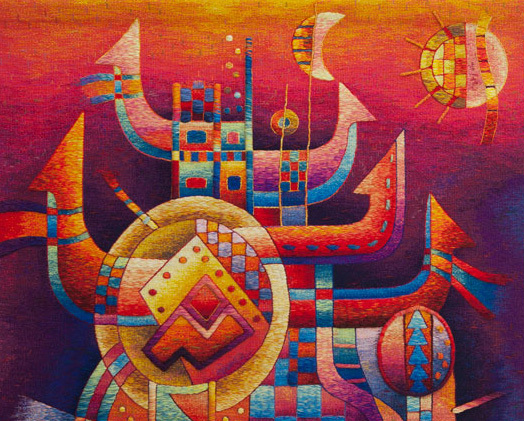 In the tapestry “Dwelling of the Condor”, for example, we can see how the Moon and Sun are designed together, representing duality and the upper world. In the middle of the piece we can find several human faces (some are in the background of the design) representing middle world, and at the bottom of the piece we see an icon that Maestro Laura has included in many of his pieces, which looks like roots are alive, almost like a snake. 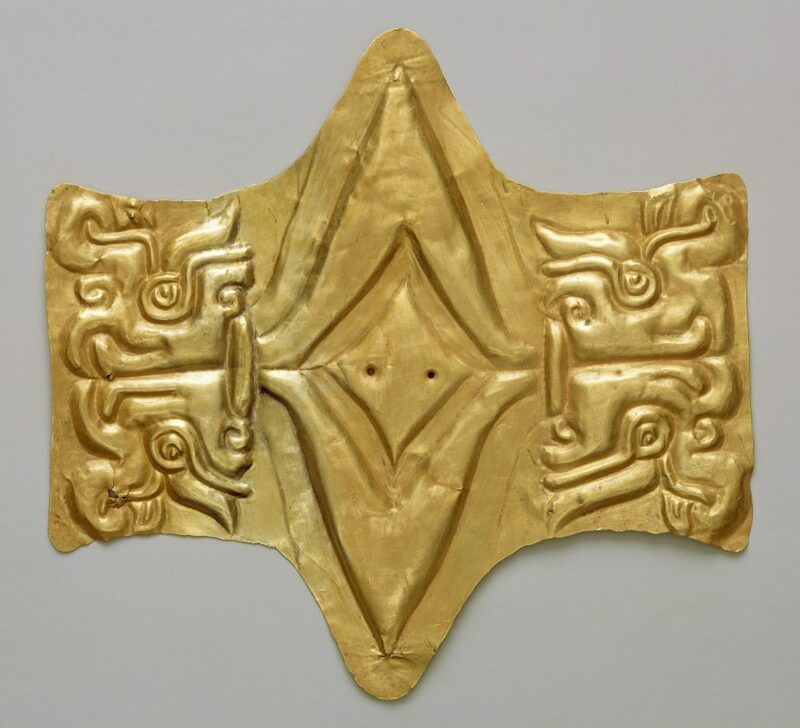 In some pieces we will also find the Inca Cross or “Chakana” which is one of the main symbols in the Andean world and has been found in a number of Andean cultures across history, from the Paracas, Chavin and Tiahuanaco Cultures, to the Incas. A lot has been said about the meaning of the Chakana but it is believed that each of the three steps found on the corners of the Chakana is a representation of the three realms. The word “chakana” is thought to be born from the Quechua word “chaka” which means “bridge” or “union”, and the suffix “-na” which means “instruments”, so the Chakana is a symbol which represents an instrument of union between the 3 realms. 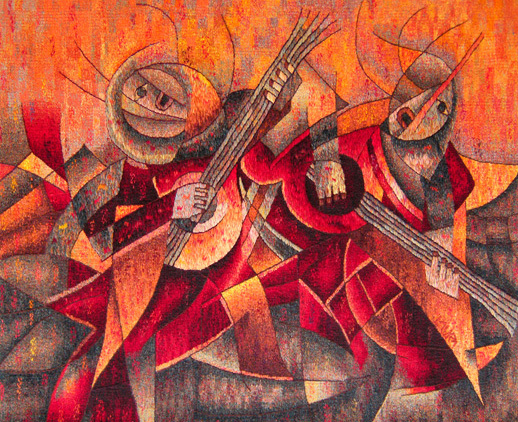 We know through the account of the Spanish chronicles and through archeological evidence that music was an essential part of life in ancient Andean cultures. People played music in their homes for entertainment, but also as part of rituals. It was used in religious ceremonies such as burials, feasts and festivals, as well as in political activities. It was also used to heal the sick and to communicate with their ancestors. 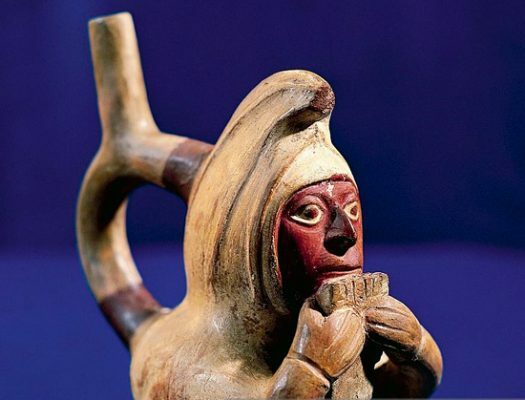 We can find evidence of this in wind instruments made from bone used in pre-Columbian ceremonies, and through its representation in ceramic, textiles and silver work. 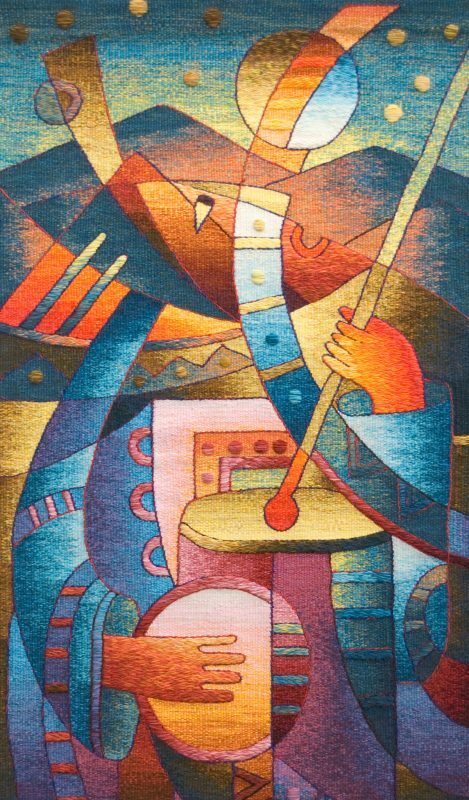 Today, music still plays a very important roles in Andean society, not only as entertainment, but also as a part of traditional ceremonies and festivities, being the guitar, the pan flute and the drum among the most important instruments. This is why Maestro Laura has created a number of pieces about musicians playing together in the crop fields during harvest festivities, for example, or about traditional dancers. Lastly, it is important to note that Maestro Laura has made a collection of works about birds, and another collection about sea life. This is because he very interested in the natural world and for him, they carry a deeper meaning of peace and continuity of our natural landscape and planet in a time of global warming and pollution. For his collection about sea life, which he has titled as the “Galapagos Collection”, he was inspired by the incredible natural life found in the Galapagos Islands in Ecuador. Although Maestro Laura is from the town of Ayacucho located in the Andes, he has lived more than 30 years in Lima, in the coast of Peru, with a close relationship with the sea and the ocean. In many of Maestro Laura’s tapestries you will also find a number patterns that repeat through different works, so it is important to make a note about the meaning of these patterns or motifs as well. Circles: Circles in the Andean cosmology carry a meaning of cycles, of cyclical time and transformation, a way to understand the world where cycles of time recur and events with them, so the circle motifs represent this cyclical time, especially when the theme of the piece is related to harvest or seasons. 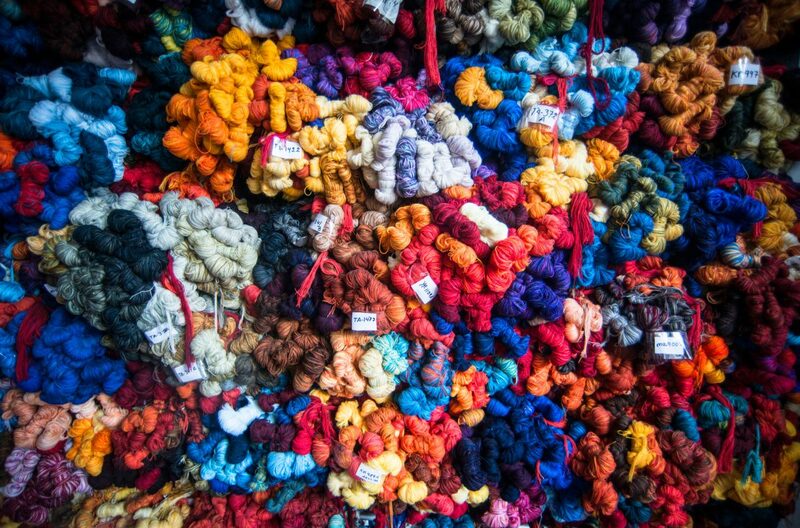 In a more physical representation, many tapestries have motifs that carry the shape of natural landscapes, sometimes seen from a birds eye view. This way we can see the circles is some tapestries are representations of lakes. Zig Zag Patters: We find these patterns in several tapestries (see image below), as the circles, they also represent a natural landscape. These patterns represent Andean terraces, steps created in the Andean slopes that are still in use today to farm, created and used not only by the Incas but by a number of Pre-Inca cultures to work on very steep areas. The terraces have shaped the Andean landscape for thousands of years and one can still see them all across the landscape when traveling through Peru and other Andean countries. Checkered Patters: These patters also represent a natural landscape, and in this case, they represent the crop fields in the Andes, when seen from a birds eye view. It is interesting to find these three patterns when flying through the Andes, as with a privilege view we are able to see the lakes as small circles, the crop fields as checkered patters and, if seen from a low altitude, the Andean terraces. Leave us a message and we will get back to you as soon as possible.